The OpenEMR Plus Cardiology Package features all of our Core Functionality Items with the addition of customized forms geared towards the needs of Cardiologists. WMT, Inc. has developed a PT/INR Tracking form to allow physicians to easily and efficiently manage their patients health needs. Our forms generate a graph to chart the patients previous INR results, giving both the physician and patient a clear visual of their progress. 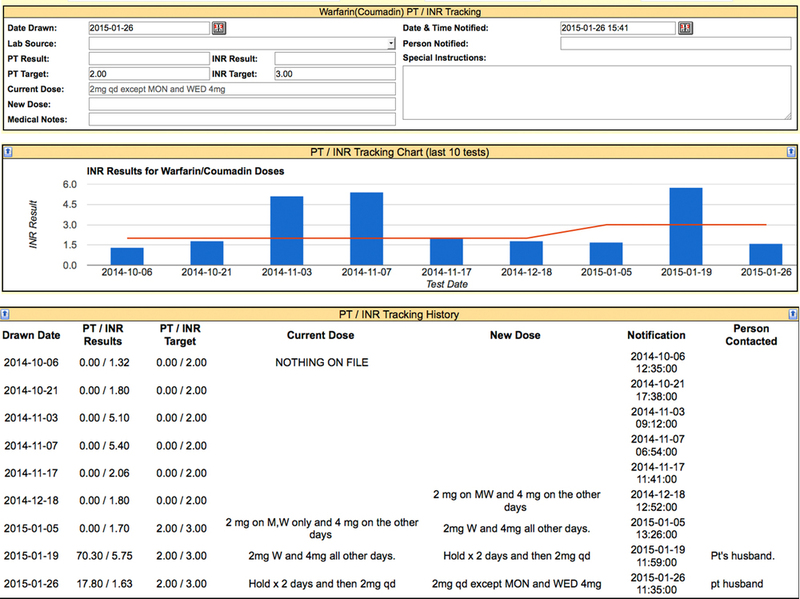 We also track the past results, targets and medication dosage information in an easy to follow log format. The Extended Exam Form was developed via the input of leading doctors throughout the country. This form is comprehensive and easy to use. It gives you every piece of information you would need to know in order to properly treat your patients, such as: Current Medications, Allergies, Surgeries, Medical History and Family History. Physicians can then easily document their exam, indicate diagnosis' and dictate patient instructions that are easily printed directly from the form. We also offer a Plan Management tool that allows you to create various plans tied to specific diagnosis codes for re-use globally throughout the system. The Plan Management tool allows you to create 10 plans per ICD-9 code that can be re-used. This allows you to efficiently document without the necessity of re-typing the same plan each time. set the time frame within which the task needs to be completed and additionally assign a specific person to complete this task should they desire. If a specific person is assigned to the order then they will receive a new message informing them that this order was made, which will include all the details of the order. Our Bi-Directional Lab Interfaces feature Lab Analytics, allowing physicians to chart and graph lab results over time. Physicians can select which tests they would like to chart over time.